Accelerating deductible expenses into 2015. If you’re a cash-basis taxpayer, you may make a state estimated tax payment before December 31, so you can deduct it this year rather than next. Both cash- and accrual-basis taxpayers can charge expenses on a credit card and deduct them in the year charged, regardless of when the credit card bill is paid. For help projecting your income and expenses or for more ideas on how you can effectively time them, please contact us in Brea (714.990.1040) or Visalia (559.732.4135) or click the button below. 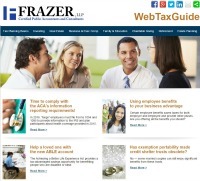 "Are You Ready for the New ACA Employer Reporting Requirements?" Beginning in 2016, large employers (those with 50 or more employees) must file Forms 1094 and 1095 to provide information to the IRS and plan participants about health coverage provided in the previous year. The forms are used by the IRS to enforce the Affordable Care Act’s (ACA’s) shared-responsibility (or “play or pay”) provision, as well as individual mandate and tax credit eligibility rules. For employers and employees who do not comply with the ACA reporting regulations, penalties will be assessed and issued. Don't miss this opportunity to get your questions about ACA answered.